Thanks to the TransSib, the south-eastern region of Lake Baikal is not only well developed but also quite densily populated. But right in its interior rises the Khamar Daban Mountain Range which will let you quickly forget civilisation. 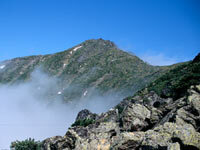 Lonesome valleys, mountain taiga, and peaks, higher than 2000 metres, invite for trips. You can see how the vegetation changes with the increase of altitude difference and watch the wildlife. Since the region is quite easy to reach by train or car you will have no difficulties to get to the different starting points of the trails. Now we want to introduce two of the many possible trails to you. The Mount Poroshisty-trail which is especially popular among Russian tourists, is one of the most spectacular and breath-taking trekking tours within the region. The tour within the Baikalsky Biosphere Reserve leads into lonesome taiga. The region's special protection status is the reason for the pristine nature you will find there. The tour up Mount Poroshisty is not only regarded as one of the most beautiful routes but also offers the opportunity of climbing from the shores of Lake Baikal to the mountains of Khamar Daban very rapidly. An overnight stay in the circus, a basin surrounded by steep mountain sides, in combination with climbing the ridge make this tour a real high-mountain adventure. And last but not least, mountaineers will be rewarded with a panoramic view over the whole southern Baikal. The starting point for the trail near Utulik can best be reached from Baikalsk or Sludyanka. Trains from Irkutsk and Ulan-Ude run daily. Arrival/departure: not all the trains between Irkutsk and Ulan-Ude stop in Baikalsk. The station is about 8 km east from the centre of Solsan district. You can reach the central bus station either by bus or car. From the bus station take a taxi towards Utulik. Arrival/departure: TransSib-trains as well as elektritshkas from Irkutsk stop here. Taxis to Utulik or Baikalsk start directly at the station. Busses to Baikalsk leave from the bus station, ul. Lenina. The tour starts right at the main road between Baikalks and Utulik, at the bridge that crosses the Babsha river. At the western end of the bridge you will go down the stairs to the river and then follow the trail which leads through the forest. There you will walk along a wall whose function probably is to protect the road against the flood. The trail then can be identified by a blue-red marking along the river. Thick forest changes with glades which are good campsites. Half an hour later you will reach the valley of the Babsha river. The trail continues at the river's right side and leads through pristine flood plain forest. 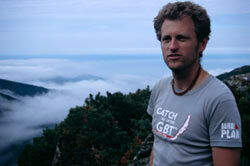 The first part of the trail was built by GreatBaikalTrail-volunteers in co-operation with Greenpeace in 2003. Sometimes it might be impossible to find a trail between the river and the slope. There you will have to climb the rocks. You will find wooden ladders and ropes that will help with the climbing. Finally, approx.two hours later, you will reach a wooden bridge across the Babsha. There you will find a nice place for a rest and have a great view on the first big rock formations. It's also a good place for camping. After crossing the bridge the now unmarked trail leads along the Poperetshny stream (also coll."Medveshi"). First you will have to climb up some stairs, then down again, and then you will have to cross another stream followed by a longer ascent up the left Poperetshny, the first river arm coming from southward direction. 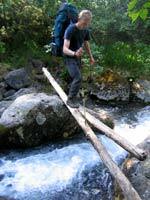 A small bridge needs to be crossed to reach the other side. Now the trail will only lead uphill. Follow the more or less stony path constantly above the stream at its right side. The vegetation changes from shrubs to fir-forest (dark taiga). After a small campsite the trail continues along the stream again. Though you might think this trail will never end, 3  4 hours later you will suddenly find yourself facing the destination: the so-called circus. In this basin surrounded by 3 steep mountain sides you will find a good place for camping at both sides of the river. You can also set up a base camp here and climb the peak the following day with a day pack. The peak itself cannot be seen from this place, for it is hidden behind the mountains east of the circus. It is essential to refill your store of waters before you start the hike. There will be no opportunity once you've started! The beginning of the trail is quite hard to find. It is situated behind the campsite at the right shore. Walking in southward direction you will leave the last trees behind you and about 15 minutes later you will also leave the stream which turns west. After passing a boulder field, the trail continues uphill. Some small paths run across the boulder so that you can easily lose your track. Anyway, following the high-piled stone marks you will somehow reach the mountain ridge after about 1 hour. A fantastic view from the pass is worth all trouble: In the east you can already see your destination, the peak. Looking back you will see Lake Baikal and the picturesque mountain lake Turistkoye (or: Myortvoye) at the other side. You should only continue the ascent when the weather is dry and calm. The trail now follows the mountain ridge in eastward direction. From a distance you can already see the marking of the summit. Some parts of the trail can only be passed by climbing and especially the last metres ask for high concentration - the goal immediately within sight you will have to step over exciting and dangerous precipices. Although this is only easy climbing (from the point of view of an experienced trekker) you should have no fear of heights. In less than 1 hour you will reach your destination and be rewarded with a unique view over the whole South-Baikal, the steep mountain peaks of the Khamar Daban Mountains, and down the valley of the Solsan river. When you started early in the morning it is possible that you can descend the circus and reach Utulik within 3  4 hours. If you have more time, however, you should plan for a longer stay on the summit or even go for a trip to the Myortvoye mountain lake (when the weather is fine) and start the descent from the circus after another night without any hassle. Ist man früh morgens vom Lager aufgebrochen, besteht die Möglichkeit vom "Zirkus" aus noch am selben Tag in 3-4 h zurück nach Utulik hinabzusteigen. Bringt man jedoch mehr Zeit mit, empfiehlt sich bei schönem Wetter ein längerer Aufenthalt auf dem Gipfel oder gar ein Abstecher zum Bergsee Mjortwoje, um nach einer weiteren Nacht im "Zirkus" am nächsten Tag in aller Ruhe hinunter zu wandern.